Words fail me. 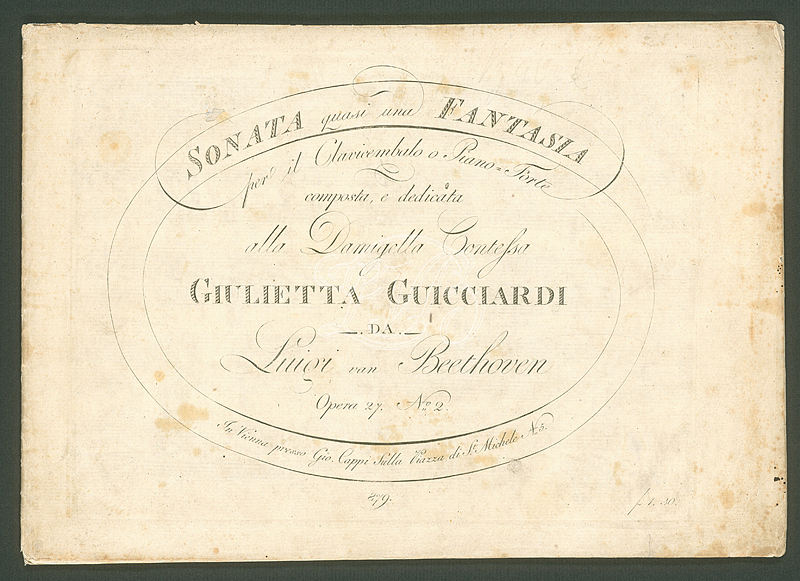 Continuing this series of posts on works with nocturnal associations, and looking for a complementary image, I came across the one above – a facsimile of the Autograph of the third movement of Beethoven’s Sonata quasi una Fantasia Op 27 No 2, also known as the ‘Moonlight’ Sonata, and below – the cover of the First Edition. What better way to introduce possibly the world’s most famous moonlit piece, published in 1802 – but it wasn’t Beethoven who gave the work that title. Barry Cooper’s excellent edition of the Beethoven Sonatas, published by the ABRSM, tells us in the commentary that the name originated in a story which appeared in 1824, ‘Theodor‘, by Ludwig Rellstab, where one of the characters suggests that the first movement portrays moonlight over a lake. The name was popularised in the 1850s by Wilhelm von Lenz, and the name has stuck. Millions will instantly recognise the sombre opening of the first movement, and/ or the title. In C sharp minor, it demands a well controlled RH which has to balance an inner accompaniment of discreet but rhythmic triplets, plus a 5th-finger melody. The LH needs harmonic awareness, and shaping. 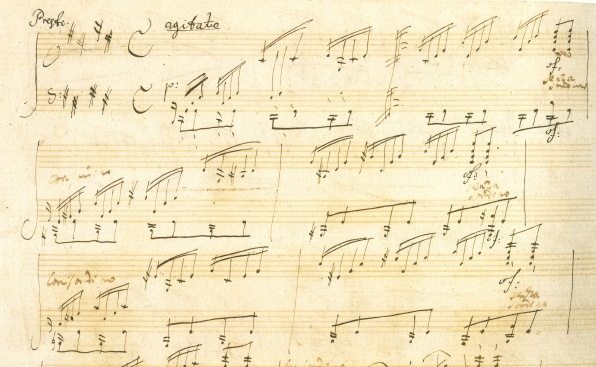 Although marked Adagio sostenuto, this movement has two minims per bar, rather than four crotchets, so the tempo must not drag, and ‘this whole piece must be played very delicately and with pedal’ – Beethoven writes: ‘si deve suonare tutto questo pezzo delicatissamente e senza sordino’. For practice, the broken chords can be turned into blocks to hear the harmonic progressions clearly; triplets can be practised staccato to lighten them, while sustaining the melody above. Note the pungent dissonances at bars 16 and 18 before the key change to F#minor in bar 23, and then the heightened tension of the higher range. All subsides to hover over a LH dominant pedal point from bar 28, Beethoven’s strategic harmonic preparation for the return of the tonic key. Note, too, the regular harmonic rhythm changing bar by bar, but then from bar 35 the RH is waylaid by a diminished 7th slowly ascending and descending, with a flattened supertonic introduced in bar 39, giving a taste of the Neapolitan 6th. The LH is finally allowed to move in bar 40 – V VI, and in bar 41 – IV V, and at last to I in bar 42. A truncated version of the opening resettles on the tonic in bar 51, and from bar 60 the LH features the distinctive dotted rhythm on a repeated g#, emphasising the dominant, before four bars of tonic chord to close. Barry Cooper’s commentary also tells us that Czerny, Beethoven’s pupil, recommended a speed of 54-63 crotchets per minute for this movement, and Czerny reported that Beethoven used soft pedal throughout, except for bars 32-39. The ABRSM’s earlier edition, with a commentary by Donald Francis Tovey, is also worth consulting, not least for Tovey’s illuminating comments. This entry was posted in Music, Nocturne - A Little Night Music and tagged Barry Cooper, Beethoven, Beethoven Sonatas, Moonlight Sonata, Sonata quasi una fantasia Op 27 no 2. Bookmark the permalink.